Fresh from facing allegations of witchcraft and murder, travelling weaver Will Rees, his heavily pregnant wife Lydia and six adopted children take refuge in Zion, a Shaker community in rural Maine. Shortly after their arrival, screams in the night reveal a drowned body ... but is it murder or an unfortunate accident? 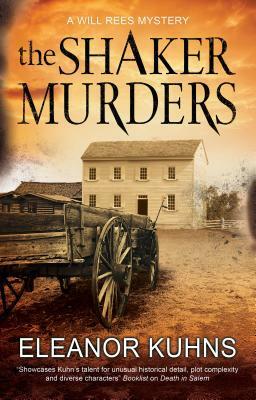 The Shaker Elders argue it was just an accident, but Rees believes otherwise. Mysteries are one of my favorite genres, and has been since I was in elementary school. Eleanor Kuhns is a master at writing mysteries that hold your attention from the very first page. Will and his wife Lydia have gone back to the Shaker community they had once been a part of because his wife Lydia was still wanted, accused of witchcraft. When people in the village start going missing, then turn up murdered, Rees is sure it is someone in the village. How safe is his family? The events just kept me turning the pages. Like all of her books, the action keeps rolling at a great pace. The end was just as suspenseful. I kept trying to guess who the murderer was. Each time I thought I had it figured out something else would happen to lead me in a different direction. I highly recommend this series.